Henley continue to build momentum in their bid to defend their Home Counties Premier League title, with an impressive performance against rivals Wycombe. 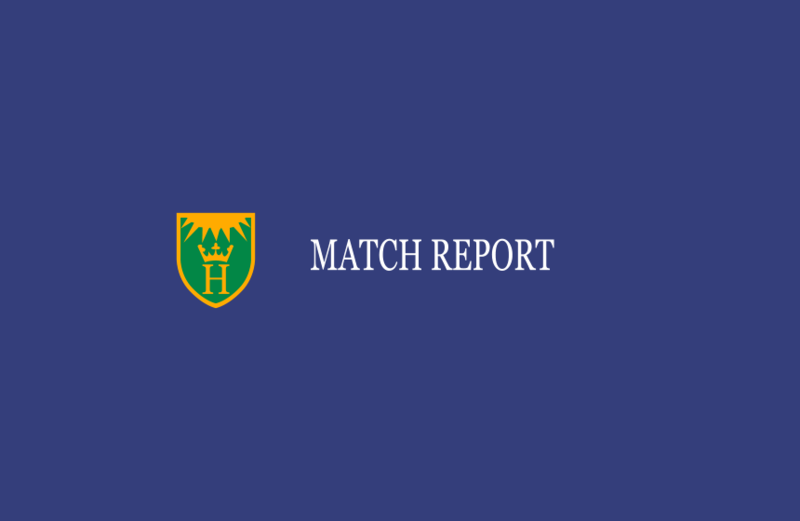 Henley continue to build momentum in their bid to defend their Home Counties Premier League title, with an impressive performance against local rivals Wycombe. From the outset Henley played the majority of the cricket, amassing 311-9 declared off 63 overs, before having the home team 176-8 off 49 overs. Unfortunately, the ensuing rain meant four valuable overs were lost, saving Wycombe’s blushes and preventing a deserved win for the away side. The result leaves Henley looming large behind the current top five, who are separated by only five points, setting up a mouth-watering fixture against new leaders Slough at home this weekend. Having won the toss, an overcast and green wicket left Wycombe captain Nathan Hawkes with the easy decision of bowling first. However, despite the bowler-friendly conditions, the hardness underneath meant opening bowlers Hampton and Parsons needed to get their lengths right in order to take full advantage. With Roberts and Rowe both in fine form with the bat, the slightly wayward start from Wycombe meant Henley were quick to capitalise and made solid progress whilst also taking the shine off the ball. Scoring at five an over, both Henley batsmen played aggressively and put the pressure back on the Wycombe attack. It wasn’t until the score had reached 68 when Roberts (29) became the first victim of the day, bowled by a Marles delivery which perhaps came down the hill a fraction, but ultimately ought to have been kept out by last week’s ton-maker. Woods joined Rowe and played freely, racing to 29 himself before he pulled a long-hop from spinner Haddow to midwicket with the score comfortably passed the hundred mark. At this stage, Rowe had passed his half-century and with some brilliant stroke play, looked set to pass the hundred he deserved the previous week. However, on the stroke of lunch, he received a snorter of a delivery from returning opener Hampton, who nicked Rowe to slip, leaving Henley 167-3 at the lunch break. Although debutant Jones was out soon after the resumption of play, unluckily adjudged caught behind to a beautiful delivery which perhaps caught the batsman’s sleeve, Morris and Barnes came together to put on a crucial partnership of 71. Both players complimented each other nicely, with Morris racing to 74 in typically ruthless fashion, before he ran passed spinner Dobb to be stumped with the score on 240-5. Barnes continued effectively and shared partnerships with both Williams (8) and Brock (14) before he was then dismissed for a valuable 40. With a few further lusty blows from Nugent (29), Henley soon declared on 311-9 – another impressive batting display full of partnerships, application and pressure-inducing stroke play. After a slight rain delay, Wycombe began their innings relatively well, with Henley’s seamers failing to learn from Wycombe’s, bowling a little too short and wide and struggling to build pressure. However having found his rhythm, Nugent soon had Casterton walking back to the pavilion, caught behind by Williams for 13. Marles joined Callis and both batters looked comfortable, although neither player showed any real intent of winning the game. Marles looked to accelerate with the score on 88 but could only edge the spin of Woods to Nugent at slip for 34. Soon after, having effectively deployed some reverse sweeps, skipper Hawkes became the victim of his strength, being caught at point by Woods off the bowling of the outstanding Singh. Tea came and went and it wasn’t long before Callis’ luck run out, trapped LBW by Singh for a frantic 52. By this stage, with the score on 130-4, Wycombe had now lost any interest in going for the win, if there was any at the outset. Singh and Woods bowled beautifully in tandem, with the latter soon accounting for Baker, who’s carefree knock came to an end with Wycombe now in danger of being skittled. Russell and Hatton however combined to chew up the overs, defending well and riding their luck as Nugent was reintroduced to the attack. However it was Singh who struck next, bowling Russell and opening up the home team’s tail-end. Hatton was trapped LBW by Nugent before bowling Haddow soon after, leaving Wycombe on 170-8. However despite some brilliant skill execution by Nugent and Afridi, who on his return to the attack looked as though a wicket could fall any moment, the home team held firm and once the rain began to set in, ensured the covers were on before any other decision could be made.